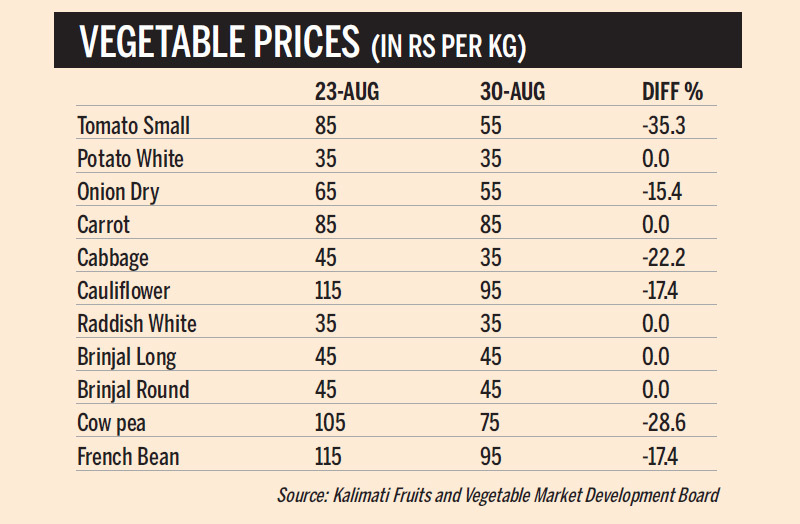 Vegetable prices in the Kathmandu Valley have started moderating this week after jumping sharply following massive flooding in the Tarai. Transportation was crippled as landslides triggered by floods blocked highways, pushing up prices by up to 88 percent in the Valley which imports most of its food requirements. Torrential rains from August 11-14 inundated huge parts of the southern plains, celebrated as the country’s food basket. The floodwaters destroyed Rs1.3 billion worth of vegetable crops in the Tarai. Prices had already started to rise with the onset of the monsoon when vegetables customarily become dearer because farmers turn their attention to growing paddy. The floods sent prices rising even more steeply. Higher vegetable prices is not good news for a country like Nepal where many households spend quite a big chunk of their food budget on the fresh produce. However, the good news is that the situation has started normalising and prices are gradually coming down. In the last one week, the retail price of tomatoes dropped 35 percent to Rs55 per kg, according to the Kalimati Fruits and Vegetables Market Development Board. Also, prices of dry onion, cabbage, cauliflower, cowpea and French bean have come down by 15-28 percent. “Vegetable prices have started moderating because of smooth supply,” said Binay Shrestha, deputy director of the board. The Kalimati Fruits and Vegetables Market, the largest vegetable market in the country, gets around 700 tonnes of vegetables per day. This supply had come down to around 400 tonnes right after the flood. The short supply caused vegetable prices to shoot up. “But we are again receiving 700 tonnes of vegetables per day, which is stabilising prices,” said Shrestha. Most of the vegetables sold in the Kalimati market come from Kavrepalanchok, Nuwakot, Dhading and Makwanpur districts. The market also gets its supplies from India and China. Another reason for the hike in vegetable prices is the recently concluded Hindu festival of Teej when many women fast and do not consume meat products, leading to a rise in demand for fresh produce, according to Shrestha. “Since the festival is over, we expect vegetable prices to come down gradually,” added Shrestha.